Schmidtke-Bode, Karsten (2014). Complement Clauses and Complementation Systems: A Cross-Linguistic Study of Grammatical Organization. PhD dissertation, University of Jena. 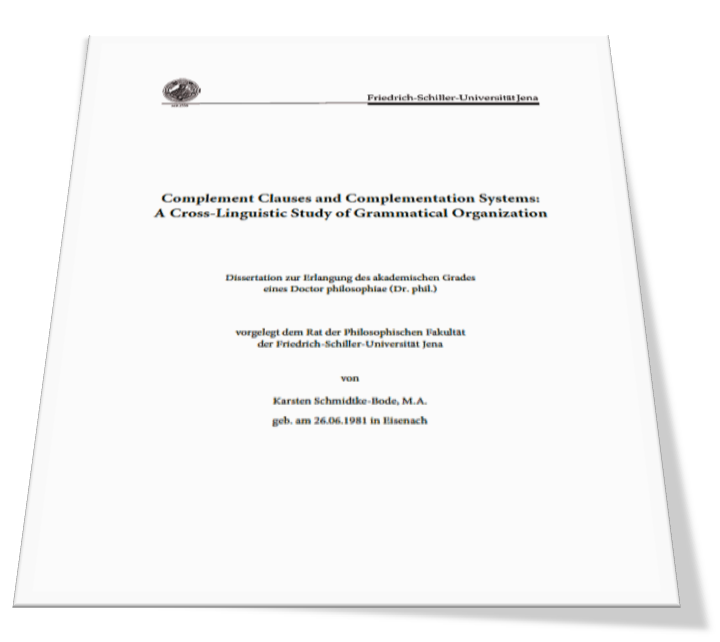 The dissertation provides a cross-linguistic investigation into the grammatical structure of complement clauses and the organization of complementation systems. Based on a balanced sample of 100 widely dispersed languages, the major goals of the present work are to set the two landmark typological reference articles on complementation (Noonan 1985|2007, Dixon 2006) onto a broad empirical basis and to explore hitherto understudied phenomena in the constitution of complementation systems. In particular, the traditional focus on object complement clauses is shifted to complements in ‘subject’ function, and the dissertation is the first to analyse systematically the cross-linguistic productivity, morphosyntactic coding, syntagmatic arrangement and diachronic rise of complements in S- and A-function, as compared to their corresponding object clauses. On a methodological plane, it combines a multivariate approach to clause-linkage with recent statistical techniques of data mining (e.g. HCFA, cluster analyses, NeighborNet, MDS) in order to measure (dis)similarities in the cross-linguistic organization of complementation constructions. This comprises, for example, a precise gauging of the degree to which the internal structure of complements is ‘desententialized’ (Lehmann 1988) and made NP-like, of the ways in which this correlates with the possible external functions and positions of the complement in the main clause, and of the ways in which these distributional patterns in complementation systems reflect the historical origins and lexical diffusion of the relevant constructions. Above all, the dissertation problematizes the conceptual and terminological foundations for the typological study of complementation, which, despite decades of intensive research, remain challenging to establish in a cross-linguistically satisfactory way. Schmidtke-Bode, Karsten (2009). A Typology of Purpose Clauses. [Typological Studies in Language 88] Amsterdam, Philadelphia: John Benjamins. 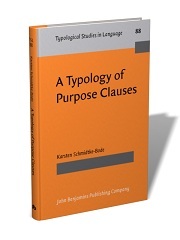 This book presents the first comprehensive typology of purpose clause constructions in the world’s languages. Based on a stratified variety sample of 80 languages, it uncovers the unity and diversity of the morphosyntactic means by which purposive relations are coded, and discusses the status of purpose clauses in the syntactic and conceptual space of complex sentences. Explanations for significantly recurrent coding patterns are couched in a usage-based approach to language structure, which pays due attention to the cognitive and communicative pressures on usage events involving purpose clauses, to frequency distributions of grammatical choices in corpora, and to the ways in which usage preferences conventionalize in pathways of diachronic change. The book integrates diverse previous strands of research on purpose clauses with a thorough empirical analysis in its own right and thus reflects the current state of the art of crosslinguistic research into this distinctive type of adverbial clause. Schmidtke-Bode, Karsten, Natalia Levshina, Susanne Maria Michaelis and Ilja A. Seržant (eds.) (2019). 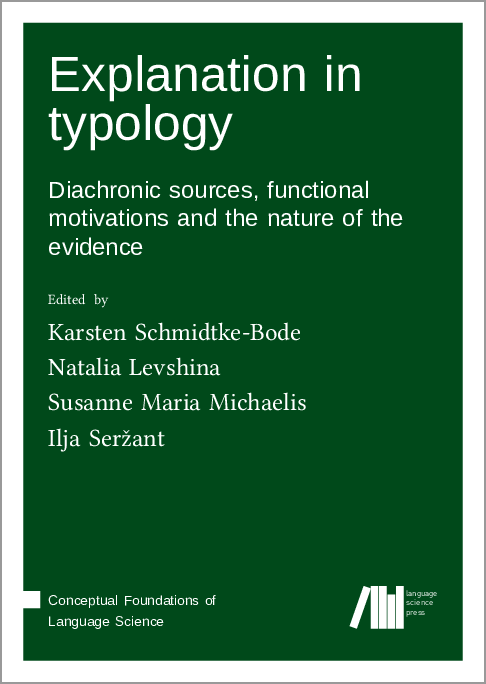 Explanation in Linguistic Typology: Diachronic Sources, Functional Motivations and the Nature of the Evidence. Berlin: Language Science Press. Schmidtke-Bode, Karsten and Holger Diessel (2017). Cross-linguistic patterns in the form, function and position of (object) complement clauses. Linguistics 55.1: 1–38. Schmidtke-Bode, Karsten (2009). Going-to-V and gonna-V in child language: A quantitative approach to constructional development. Cognitive Linguistics 20.3: 509-538. Schmidtke-Bode, Karsten (2019a). Introduction. In: Explanation in Linguistic Typology: Diachronic Sources, Functional Motivations and the Nature of the Evidence, eds. Karsten Schmidtke-Bode, Natalia Levshina, Susanne Maria Michaelis and Ilja A. Seržant. Berlin: Language Science Press. iii-xii. Schmidtke-Bode, Karsten (2019b). Attractor states and diachronic change in Hawkins’ Processing Typology. In: Explanation in Linguistic Typology: Diachronic Sources, Functional Motivations and the Nature of the Evidence, eds. Karsten Schmidtke-Bode, Natalia Levshina, Susanne Maria Michaelis and Ilja A. Seržant. Berlin: Language Science Press. 123-148. Schmidtke-Bode, Karsten and Eitan Grossman (2019). Diachronic sources, functional motivations and the nature of the evidence: A synthesis. In: Explanation in Linguistic Typology: Diachronic Sources, Functional Motivations and the Nature of the Evidence, eds. Karsten Schmidtke-Bode, Natalia Levshina, Susanne Maria Michaelis and Ilja A. Seržant. Berlin: Language Science Press. 223-241. Schmidtke-Bode, Karsten and Natalia Levshina (2018). Reassessing scale effects on differential case marking: Methodological, conceptual and theoretical issues in the quest for a universal. In: Diachronc Typology of Differential Argument Marking, eds. Ilja A. Seržant and Alena Witzlack-Makarevich. Berlin: Language Science Press. 509-537. Schmidtke-Bode, Karsten (2012). The performance basis of grammatical constraints on complex sentences: A preliminary survey. In: Clause Linkage in Cross-Linguistic Perspective, eds. Volker Gast and Holger Diessel. Berlin: De Gruyter Mouton. 415–448. Schmidtke-Bode, Karsten (2010). The role of benefactives and related notions in the typology of purpose clauses. In: Benefactives and Malefactives. Case Studies and Typological Perspectives, eds. Fernando Zúñiga and Seppo Kittlä. [Typological Studies in Language 92] Amsterdam/Philadelphia: John Benjamins. 121-146. Schmidtke-Bode, Karsten (2015). Review of Jürgen M. Meisel, Martin Elsig and Esther Rinke (2013), Language Acquisition and Change: A Morphosyntactic Perspective. Edinburgh: EUP. First Language 35.3: 272–275. Schmidtke-Bode, Karsten (2010-2014). Structure and Linerization in Complex-Sentence Systems. FSU Jena.